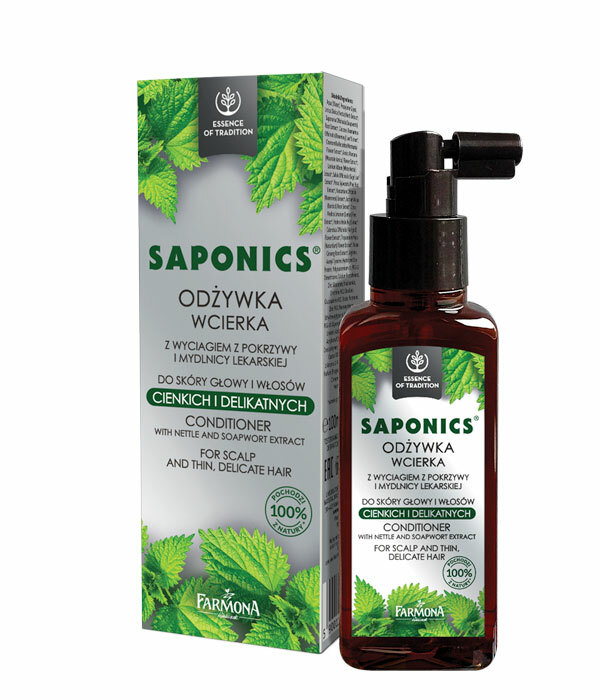 Saponics Conditioner contains concentrated bioactive nutrients, D-Panthenol as well as stimulating and conditioning vitamins A, E and F. Active horsetail extract rich in soluble silica provides the basic building blocks of hair. D-Panthenol regenerates and strengthens the hair structure, increases its thickness and moisturizes with long lasting effect. Vitamins A and F regulate water – fat balance of the skin and increase hair resistance to damage, and vitamin E catches free radicals. A special conditioning component facilitates combing and reduces static electricity. Apply nutritional complex on dry or washed hair. Gently rub onto the scalp. Use daily for two weeks. After a few days repeat the treatment. Do not rinse. Kerastin, Trichogen, Polyplant Hair, extracts of horsetail and birch, glucose, vitamins A, E and F, provitamin B5. Chamomilla Recutita (Matricaria) Flower Extract, Arnica Montana (Mountain Arnica) Flower Extract, Rosmarinus Officinalis (Rosemary) Leaf Extract, Lamium Album (White Nettle) Extract, Salvia Officinalis (Sage) Leaf Extract, Pinus Sylvestris (Pine) Bud Extract, Nasturtium Officinale (Watercress) Extract, Arctium Majus (Burdock) Root Extract, Citrus Medica Limonum (Lemon) Peel Extract, Hedera Helix (Ivy) Extract, Calendula Officinalis (Marigold) Flower Extract, Tropaeolum Majus (Nasturtium) Flower Extract, Panax Ginseng Root Extract, Arginine, Acetyl Tyrosine, Arctium Majus Root Extract, Hydrolyzed Soy Protein, Polyquaternium-11, PEG-12 Dimethicone, Calcium Pantothenate, Zinc Gluconate, Niacinamide, Ornithine HCl, Citrulline, Glucosamine HCl, Biotin, Panthenol, Zinc PCA, Polysorbate 20, PEG-20 Glyceryl Laurate, Tocopherol, Linoleic Acid, Retinyl Palmitate, Acrylates/C10-30 Alkyl Acrylate Crosspolymer, PEG-40 Hydrogenated Castor Oil, Triethanolamine, Diazolidinyl Urea, Iodopropynyl Butylcarbamate, Parfum (Fragrance), Linalool, Benzyl Benzoate, Alpha-Isomethyl Ionone, Citral.